Both interventions follow 4 stages: assessments for learning, selecting the appropriate book/numeracy focus, the individual sessions and ongoing monitoring. Scroll through the information below to find out more and visit our page about delivery of the interventions to see examples of the supporting materials and online tools that go with Catch Up® Literacy and Catch Up® Numeracy. The trained teaching assistant or teacher uses our bank of easy-to-administer assessments to determine what the learner can do and where their needs lie. The results are used to set Catch Up® Literacy or Catch Up® Numeracy targets and identify the appropriate starting point. For Catch Up® Literacy, the results of the assessments are used to identify the correct starting book level. You can then choose an appropriate book (from your existing collection) using the Catch Up® Literacy online booklist. 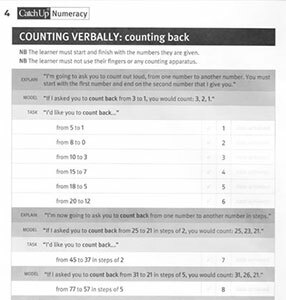 For Catch Up® Numeracy, the results from the assessments are used to create a Catch Up® Numeracy learner profile. Each individual learner will have their own profile of need across the components of numeracy. A record sheet (from the learner’s Catch Up® progress booklet) is completed during each individual session. This ongoing record provides valuable information about the learner’s needs and progress. The teaching assistant and teacher regularly monitor the progress booklet and sessions log, and review the learner’s Catch Up® Literacy or Numeracy targets. We recommend that progress is also monitored by means of a standardised test.